Stops signs can be placed on both the right and left side of the intersection approach in order to draw attention to the signs. Stop signs can be placed on both the right and left side of the intersection approach in order to draw attention to the signs (Atkinson et al. 2014). Atkinson et al. (2014) suggest that the second sign should be placed in the median, if possible, using a small mountable curb. Use of a second stop sign is covered in the Manual on Uniform Traffic Control Devices (MUTCD) (FHWA 2009) under Section 2A.15 Enhanced Conspicuity for Standard Signs. 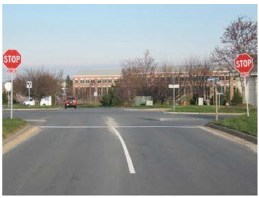 Two examples of double placement of stop signs (FHWA 2008 top and Atkinson et al. 2014 bottom). The MUTCD (2009) indicated a crash reduction factor of 11 percent for all crashes and 55 percent for right angle crashes with installation of double stop signs. Atkinson, Jennifer E., Brian E. Chandler, Vernon Betkey, Karen Weiss, Karen Dixon, Anna Giragosian, Kelly Donoughe, and Cara O’Donnell. Manual for Selecting Safety Improvements on High Risk Rural Roads. Report FHWA-SA-14-075. Federal Highway Administration, 2014. FHWA. Two Low-Cost Safety Concepts for Two-Way STOP-Controlled, Rural Intersections on High-Speed Two-Lane, Two-Way Roadways. Publication FHWA-HRT-08-063. Federal Highway Administration, Research, Development, and Technology, McLean, VA, 2008.